See some examples of how a conversation might go. A great way to meet new people and understand your old friends on a deeper level. 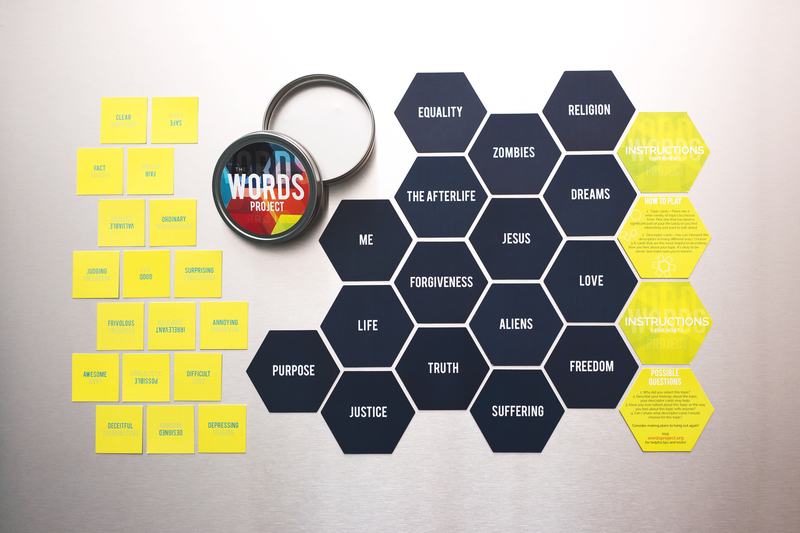 The Words Project tins are now available for $12.99 each through the Cru store. The Words Project is a great way to meet new people and understand your old friends on a deeper level. Your sleek, pocket-sized tin contains 16 topic cards and 18 descriptor cards, along with a full set of instructions. You’ll start a conversation using the cards to engage with others and explore the topics they choose and how they describe them. You will be surprised how quickly the discussion can expand to a spiritual conversation, and maybe even extend to a future connection. Check out our Basics and Examples for more on how to engage with your friends or new people you meet. Lost your instruction booklet? Click here for a copy of the basic instructions. What Is The Words Project? v2.0 from InnovationTeam on Vimeo. Find out more about The Words Project by watching this short video. The Words Project is being developed by the Innovation Team of Cru. We appreciate you checking out our website, and providing feedback on The Words Project! This site rocks the Brisket Skin for Thesis.